Monument to Henry Ryder, evangelical and philanthropical Bishop of Lichfield and Coventry (1777-1836): whole monument and profile view. By Sir Francis Chantrey (1781-1841), 1841 according to Smith — sources differ. Near the font, outside St Stephen's Chapel in Lichfield Cathedral, Warwickshire. 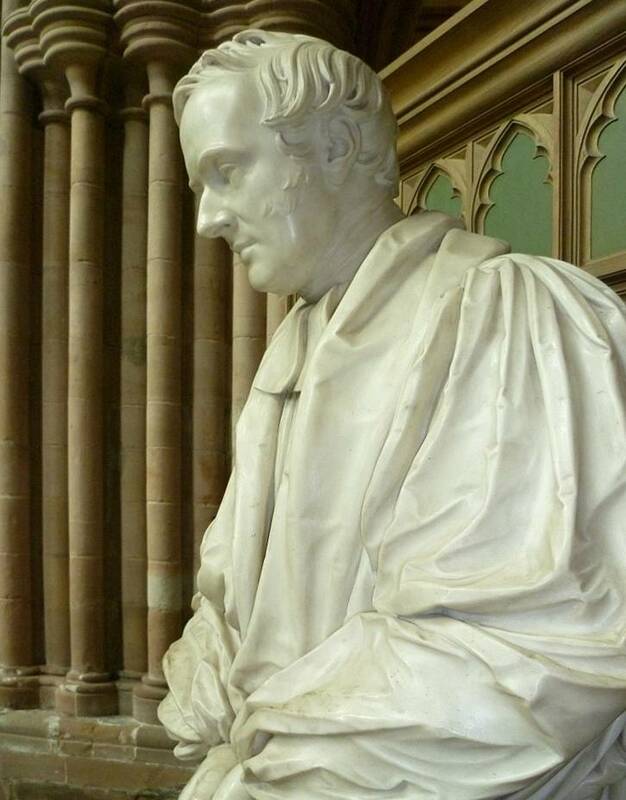 Bishop Ryder was particularly known for his charity, endowments and conscientiousness: "He had built churches in his diocese to care for an increasing population" (The Carvings of Lichfield Cathedral, 3). Profile from the other side. 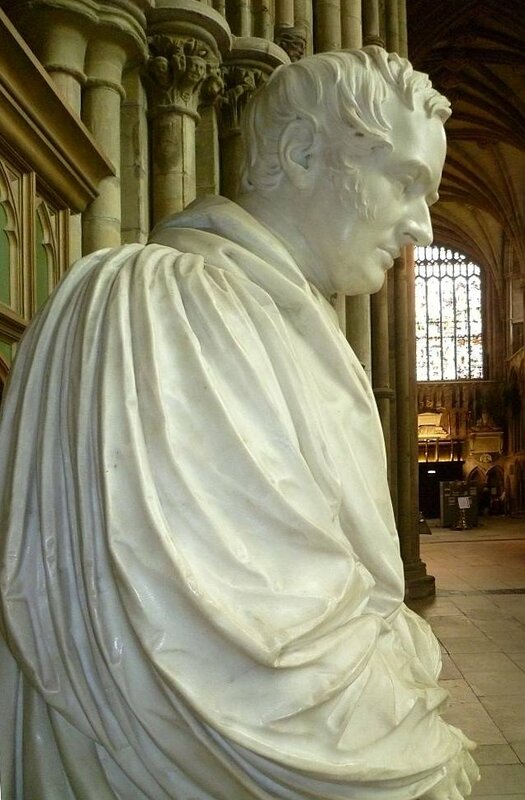 Ryder's biographer notes in connection with this sculpture that the bishop would "probably have appreciated more the new church built in his memory in a populous suburb of Birmingham" (Smith). That particular church, in Gem Street, Birmingham, was later rebuilt, and finally demolished in 1960 (see "Churches Built since 1800"), so his monument in the cathedral has outlasted it. Notice the fine detailing of the robes, with its many folds, and the taselled kneeling cushion. But there is nothing showy about the figure, whose lowered eyes and joined hands suggest that he is lost in prayer. It is a suitable posture: compare this to Chantrey's 1825 memorial sculpture to Bishop Brownlow North in Winchester Cathedral. "Churches Built since 1800." A History of the County of Warwick: Vol. 7: The City of Birmingham (1964): 379-396. British History Online. Web. 1 November 2012. Smith, Mark. "Ryder, Henry (1777-1836)." Oxford Dictionary of National Biography. Online ed. Web. 1 November 2012.